A 30-year-old woman was involved in a low-impact motor vehicle accident. 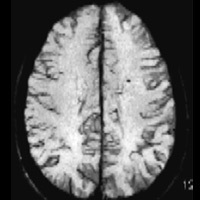 Conventional MRI revealed scattered foci of blooming/susceptibility artifact within deep/subcortical white matter of the corona radiata (left greater than right). Referring clinician ordered diffusion tensor imaging (DTI) of the brain to evaluate and potentially confirm mild/moderate traumatic brain injury (TBI). 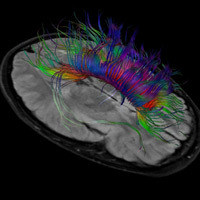 Figure A illustrates a color-coded fractional anisotropy (FA) map that indicates directionality of white matter bundles (red = commissural fibers, green = anteroposterior association fibers, and blue = craniocaudal projection fibers). Figure B illustrates a focus of susceptibility within the left corona radiata by susceptibility-weighted imaging. Figure C demonstrates several regions of interest (ROI) within the bilateral corona radiata, primarily within craniocaudal white matter fibers. FA values within the right corona radiata ranged between 0.37 and 0.42. Within the left corona radiata, ROI ranged between 0.31 and 0.39. Figure D is a reconstructed image of white matter tractography superimposed on axial FLAIR slab image. DTI was performed using a 3.0 T Achieva system (Philips Healthcare). DTI metrics compared with age-matched controls. TBI is relatively common and can occur even after mild head trauma. Long-term neurologic and neuropsychological abnormalities from TBI pose formidable challenges to patients and their healthcare providers. TBI is the result of traumatic axonal injury. Acceleration-deceleration, rotational, and stretching forces on white matter tracts damage nerve fibers. Predilection sites of injury include the corticomedullary junction, corona radiata, corpus callosum, and internal capsular white matter. 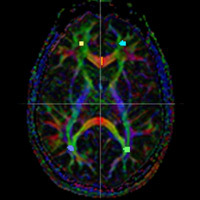 Assessing white matter (axonal) integrity is essential for detecting TBI. Conventional MRI has limited sensitivity in documenting TBI unless moderate or severe. DTI delineates axonal organization. DTI uses water motion as a probe to infer neuroanatomy based on the anisotropic movement of water molecules. (Anisotropy is essentially the property of being directionally dependent.) DTI metrics are dominated by static anatomy and less influenced by physiology. Established scalar invariants of the diffusion tensor are FA and apparent diffusion coefficient. FA ranges between 0 (isotropy, no directionality) and 1 (maximum anisotropy). Normal white matter is highly anisotropic. Reduction of white matter FA implies reduction in anisotropic water movement. Both axonal injury and demyelination are associated with decreased FA. In a sentinel paper by Rutgers et al, 21 patients with mild TBI were compared with 11 normal healthy controls. Patients with mild TBI demonstrated decreased FA in various white matter fibers and bundles, principally supratentorial projection fibers, callosal fibers, and fronto-temporo-occipital association fibers. At the Barnabas Health Ambulatory Care Center, Philips’ FiberTrak technology is utilized for all MR applications. The technology highlights essential fibers and provides quantitative metrics. Applications include defining diffuse axonal injury, assessing axonal integrity in demyelinating conditions, and highlighting essential fibers (motor, language) preoperatively. DTI sequences are performed using spin-echo echo planar imaging. The case herein employed medium directional resolution (15 directions, 2 X 2 X 2 mm3, b = 800 s/mm2, 4 minutes scan time). — Rahul V. Pawar, MD, is an attending radiologist with Saint Barnabas Healthcare in Livingston, New Jersey, and a consultant for Philips Healthcare North America. Mori S, Zhang J. 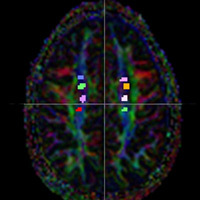 Principles of diffusion tensor imaging and its application to basic neuroscience research. Neuron. 2006;51(5):527-539. Rutgers DR, Toulgoat F, Cazejust J, Fillard P, Lasjaunias P, Ducreux D. White matter abnormalities in mild traumatic brain injury: a diffusion tensor imaging study. AJNR Am J Neuroradiol. 2008;29(3):514-519. Xu J, Rasmussen IA, Lagopoulos J, Haberg A. Diffuse axonal injury in severe traumatic brain injury visualized using high-resolution diffusion tensor imaging. J Neurotrauma. 2007;24(5):753-765.